Spiced lamb flatbreads with mint yogurt dressing | Keeps Me Out Of Mischief! I am the cook of the house. My husband can cook if absolutely necessary but prefers it if I’m in charge of creating in the kitchen. Sometimes I have a real lack of inspiration which is normally solved by a quick stumble on the internet. Sometimes I know exactly what I want to cook but completely lose track of time so dinner isn’t ready when he gets home from work. This happens far more regularly in the holidays; I find interesting things to do and I forget to look at the time and suddenly his car his drawing up outside the house and there’s no tea on the table and I realise that I’m starving hungry too! Today was one of these days; first day of the holidays and I wanted to do interesting stuff. I went out for a long bike ride, met my mum for a natter and pottered around the house dreaming up projects to fill the holidays. I was just settling down with a drink when my husband’s car appeared outside and I knew that I needed to prepare something quick! These spiced lamb flatbreads are perfect when you need something on the table fast as they take about 10 minutes to prepare. You will need: 1tbsp oil, 400g diced lamb, 1 tsp ground cumin, 1 tsp ground cinnamon, 1 tsp paprika and 1tsp turmeric, 3tbsp plain yogurt, handful of finely chopped mint, two flatbreads and salad for serving. Gently heat the oil in a frying pan and add the spices. Make sure the heat is not too ferocious, you don’t want to burn the spices. Mix the spices into the oil, when you start to smell the spices add the lamb and gently fry in the spices for about 10 minutes, stirring frequently. The lamb will be gently squishy between your fingers when cooked. While the lamb is cooking mix together the yogurt and mint and chop the salad. 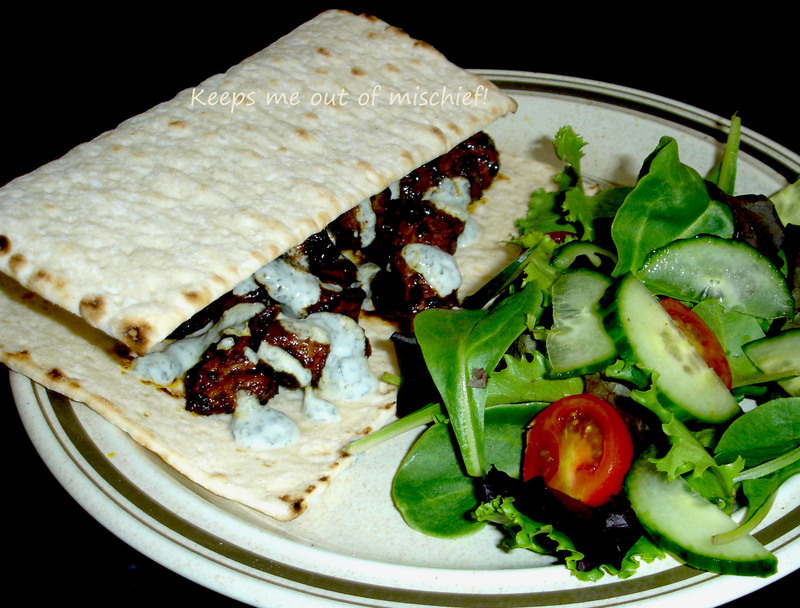 Place the lamb inside the flatbread and drizzle the mint yogurt over it. Serve with salad.